We’ve all heard the latest trends regarding that hard-to-reach audience we’ve dubbed the Millennials (those born roughly between the years 1980 and the early 2000s). And with so many how-to articles out there, it’s hard to really understand who these folks are and what they want. Here are just a few fun facts about this generation: 50% consider themselves politically unaffiliated, they have the highest average number of Facebook friends, 55% have posted a selfie or two to social media sites, and there are roughly 80 million of them. This makes Millennials the biggest generation thus far. And one thing is for certain, based on research, they are definitely changing the landscape of the food industry. So what do Millennials care about when it comes to food? According to a 2014 study by the International Food Council (IFC), Millennials have the highest level of awareness out of any age group when it comes to food sustainability, and they are willing to pay more for it. 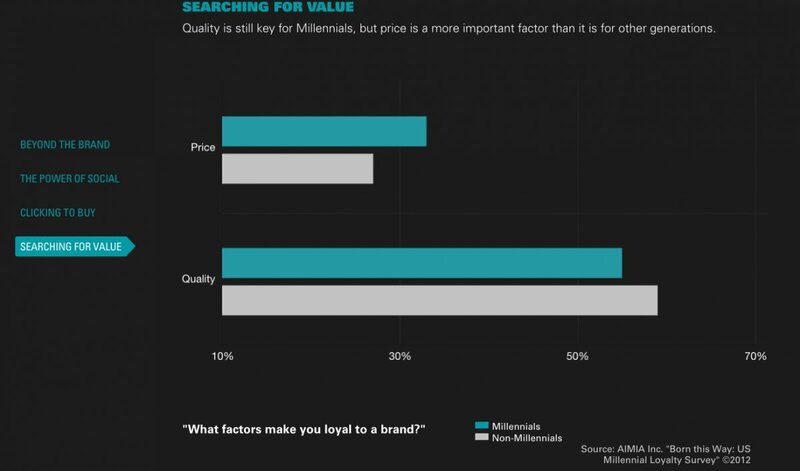 And when it comes to quality vs. price, Millennials are more apt to be loyal to a brand deemed to have quality products as opposed to a brand that has a better price point. Take McDonald’s for example. In August of 2013, the fast-food chain reported a 13% decline in consumption for people between the ages of 19-21 since 2011. And while Millennials are still dinning out, they are opting for franchises like Chipotle and Five Guys. Why? These chains pride themselves on using local producers and sustainable food items, which makes paying that extra $2.00 for guacamole not so bad to this generation. Additionally, Millennials are more apt to choose products that are socially responsible and produce lower carbon footprints. For example, Millennials are now paying attention to how much energy, water and effort it takes to grow, manufacture and transport food, including the packaging process. And as this environmentally friendly generation matures and moves into prime spending age, manufacturers will need to evolve the packaging of food products to ensure they are created with eco-friendly and recyclable materials if they wish to appeal to these folks. This generation, as research states, is more aware of their health than any other generation thus far, especially when it comes to what goes into their bodies. Locally grown, cage-free, all-natural, organic—these are all terms Millennials tend to gravitate towards when making food choices. As a result, organic coffee shops are popping up everywhere, farm-to-table restaurants are all the rage, and even private label brands are seeing increases in sales, with Millennials opting for those over national brands due to the perception that these labels are more innovative. Millennials are also reading labels and are more aware of what the items on the labels mean—they understand the ingredients and what goes into their food more so than their parents and grandparents. As a result, we’re seeing an increase in natural and organic claims as we navigate through the grocery aisles. Food manufacturers have an interesting challenge ahead, but also a great opportunity. The ones that will ultimately gain popularity among Millennials will be those that are willing to innovate while staying authentic. Millennials not only value the transparency of brands, they are also aware of shortcomings when it comes to unsubstantiated claims. Food manufacturers must now walk the line between making all-natural and sustainable product claims, and being 100% truthful in their statements. When it comes down to it, Millennials will do the research, read the labels and uncover the truth. So how do you appeal to Millennials, while also mitigating the risks when it comes to labeling your product natural, organic or GMO-free? To answer tough questions like this, TraceGains got the inside scoop from Attorney Antonio Gallegos, who advises on compliance with regulations administered by the FDA, FTC, USDA and similar state-level agencies, and co-produced a guidance report. Use this free Natural Labeling Guidance Report to help you make informed decisions in the future for your products. Do you have additional tips for reaching Millennials? Leave a comment below and let us know!